Why do you bring your mistakes here? Kofi Annan has joined with President Obama, Monsanto, AGRA, and the Gates foundation to promote and execute food aid that replaces bags of wheat, rice and corn (agricultural dumping) with bags of pesticides, herbicides, chemical fertilizers and genetically engineered seeds. The end result will be to starve people in Africa and feed corporations in the US and Europe. Under the guise of “sustainability” the [Gates] Foundation has been spearheading a multi-billion dollar effort to transform Africa into a GMO-friendly continent. The public relations flagship for this effort is the Alliance for a Green Revolution in Africa (AGRA), a massive Green Revolution project. Up to now AGRA spokespeople have been slippery, and frankly, contradictory about their stance on GMOs. 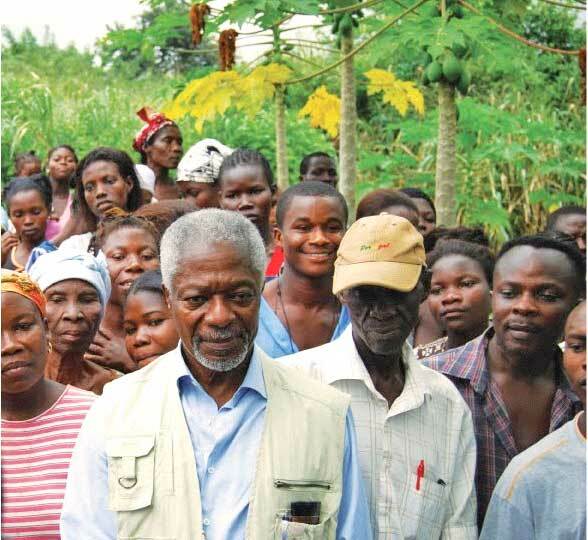 Kofi Annan is Chairman of the Board of Directors for AGRA. He is convening a conference in Ghana in the first week of September. As detailed in this blog, and by others, both AGRA and USAID top positions are filled with people that come from Monsanto and Dupont. African heads of state, industry representatives, the international donor community and farmers will meet in Ghana at the African Green Revolution Forum (AGRF) in the first week of September. Delegates will create an action plan on the acceleration of a Green Revolution in Africa. Samuel Amoako has reported on this as well: Kofi Annan Hosts Forum On Africa’s Food Security in the Ghanaian Times on August 11. 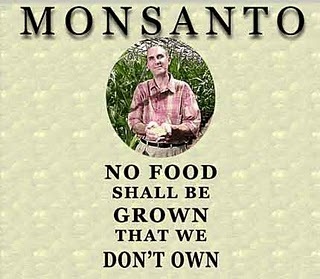 The farmers of southern Kentucky have been enslaved by Monsanto. The previous generation fell for an ad campaign called “Hi-bred” or “High-Bred”, and the current generation is stuck with fulfilling the contracts their fathers signed. The chemicals that Monsanto has contractually required be applied to those fields have so damaged the soil that the only way to get anything to grow in the fields now is to keep applying more of those blasted chemicals. So even if a person who inherited a contract WANTS to discontinue the agreement with Monsanto when the contract expires, they are unable to do so unless they want to leave the land fallow for many, many, many years. Most farmers cannot afford to do this, as this would mean little to no income for their families for somewhere between 5 to 20 years, depending on how long it would take for the soil to renew itself. I’ve always had enormous respect for Kofi Annan, I do not understand his participation in this and it bothers me a great deal. Even though I admire and respect him there are no free passes with a subject like this. Genetically modified crops produce less, not more, than conventional crops. Most of the world’s food is not produced on industrial mega-farms. 1.5 billion family farmers produce 75 percent of the world’s food. The hunger problem is not caused by low yields. The world has 6 billion people and produces enough food for 9 billion people. And as I’ve discussed before, the smaller the farm the greater the yield. There is an inverse relationship between the size of farms and the amount of crops they produce per hectare. The smaller they are, the greater the yield. The key to true food security is food sovereignty, and the key to food sovereignty lies in who controls the land. The problems of both starvation and obesity stem from injustice in the way farmland and food are distributed. AGRA policies will poison the land and water, destroy local seeds and seed gene pools that provide the true hope for food sustainability. Local agriculture in most parts of the world has developed seeds that are tough and resistant to local pests, weeds, and local environmental dangers such as droughts or floods. AGRA wishes to replace these seeds with ones that need expensive, continuous, and ever expanding chemical coddling. These chemicals will poison the land, the water, and the people. Additionally the Gates Foundation, Monsanto, and other corporate interests are investing in a doomsday seed bank, in which they will own the world’s agricultural gene pool. They are storing seeds from all over the world. In the event of genetic disaster, they will own the surviving gene pool. Some of the greatest opposition to evolution comes from the farmers of the Cotton Belt, and that is where Taylor is seeing one of the most dramatic cases of evolution in action on this planet. … in the year 1940, cotton farmers began spraying their fields with the chemical compound dichlorodiphenyltrichloroethane, better known as DDT. These first insecticidal sprays killed so many insects, and killed so many of the birds that ate the insects, that in biological terms the cotton fields were left standing virtually vacant, like an archipelago of newborn islands – and out of the woods and hedgerows fluttered [the cotton destroying moth] Heliothis virescens. In the next few optimistic years, pesticide manufacturers assaulted Heliothis with bigger and bigger doses of DDT. They also brought out more poisons from the same chemical family: aldrin, chlordane. The aim was nothing less than the control of nature, and pesticide manufacturers believed that control was within their grasp. The annual introduction of new pesticides rose from the very first product, DDT, in 1940, to great waves of chemical invention in the 1960s and 1970s. In those decades, dozens of new herbicides and insecticides were brought to market each year. Heliothis became on of the most heavily sprayed species in what amounted to a biological world war. Through it all, the moths clung to the cotton. In short, pesticides and herbicides destroy most of the insects, plants, and often other animals in those fields where they are used. But nature fights back. Those insects and weeds that can resist the chemicals initially, breed and grow stronger. They have no competition except from the chemicals, and they quickly evolve immunity, even as the chemicals become stronger and more toxic. Stronger and more toxic chemicals are needed to fight the new insects and weeds, and the destructive cycle continues. The chemicals wind up in the food, and run off into the land and the water, creating an ever increasingly toxic environment for humans and many other plants and animals. Genetically modified seeds, GMOs, are designed to be used as part of a program involving chemical pesticides, herbicides, and fertilizers. Their effect on farmers is usually to lock them into a cycle of debt, as described by Pearl above, and as experienced and protested in many countries including India and Brazil, as mentioned above. Terminator seeds, also known as suicide seeds or homicide seeds, will not regenerate, so instead of saving seeds, farmers have to buy new seeds each year, as well as investing in more, and more toxic chemicals each year that are necessary to make the GMO seeds grow. This cycle has created death and destruction in many places, including hundreds of farmer suicides in India. I’ve heard that what doesn’t kill you makes you stronger, and that is certainly the case for the insects and weeds targeted by chemical pesticides and herbicides. Those that don’t die become very much stronger. We have already have super bugs and super weeds, thanks to the efforts of companies such as Monsanto, Dupont and Syngenta. Evolution can move very fast, not just fast enough to observe, but fast enough to leave us humans struggling in its wake. Monsanto and the other agricultural chemical companies market each new product as though it is the end of some pest, that evolution stops at this point, and we can just relax. In fact each new chemical is the creator and the beginning of many more powerful threats. And the more powerful the chemical tools we use against these threats, the more those chemicals poison us and strengthen the insects and weeds we are fighting. Over time, this will require some degree of land mobility and a lower percentage of total employment involved in direct agricultural production. Family farmers, who produce 75% of the worlds food, will gradually be displaced, driven off their land, and the land will be poisoned and ruined. There will be less food, less healthy food. More people will starve, while more corporations will get fat. The first part of this article was published, text only, on GhanaWeb on September 13, 2010. You can read it here. However, the comments are not archived. You can follow the fight against GMOs and corporate rule in Ghana at Food Sovereignty Ghana. And follow discussions on the FSG Facebook page. Time to rebuild national food economies! 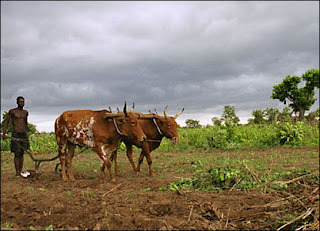 Jamaal Montasser took this shot of a man ploughing a field with cattle while on a work placement with Ghana’s ministry of agriculture. This current food crisis is the result of many years of deregulation of agricultural markets, the privatization of state regulatory bodies and the dumping of agricultural products on the markets of developing countries. According to the FAO, liberalized markets have attracted huge cash flows that seek to speculate on agricultural products on the “futures” markets and other financial instruments. There is lots more, read the letter. 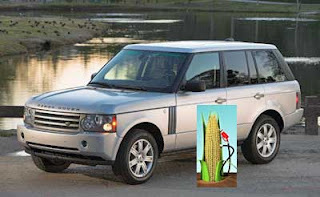 One tank full of ethanol for this Range Rover, a trip to the beach, a few commutes to work, will require enough grain to feed one person for one year. Increasing production of biofuels to combat climate change will release between two and nine times more carbon gases over the next 30 years than fossil fuels, according to the first comprehensive analysis of emissions from biofuels. It seems obvious that this is a really dumb idea, but that is just what international corporations and some really bad leadership in Africa are planning. Africa appears to plunge from one corporate nightmare to another. Just as we begin to come to terms with the colonially-sponsored corporate conquest of our oil resources, along comes a new wave of ‘green’ companies turning fertile African lands to Northern ‘gold’. Senegalese president and agrofuel promoter Abdoulaye Wade has called this ‘a new revolution in Africa’. Others have likened it to ‘the new scramble for Africa’.
. . . large tracts of arable land are being sold off to the highest bidders with little regard for the repercussions on local populations livelihoods and food security. A recent study published by the Africa Biodiversity Network (ABN) provides compelling evidence from Tanzania, Uganda, Zambia and Benin that the misguided scramble for projects could lead to an environmental and humanitarian disaster on the continent. For instance, Timothy Byakola reports that a plan is underway to convert a third of Uganda’s prime rainforest reserve, Mabira Forest, into agricultural land on which sugarcane will be planted for ethanol production. According to Byakola, President Yoweri Museveni has vociferously supported this controversial project, ignoring community opposition to it. The consequences of the deforestation of 7,100 hectares of one of the key water catchment sources for the Nile River and Lake Victoria, and the implications for the communities around Mabira which depend on the forest as a source of livelihood, are potentially enormous. Grain prices, particularly maize and wheat are shooting through the roof. People are already going hungry in a number of countries as a result. And the switch to biofuel crops damages protein supply, driving up the price of animal feed, as well as the price of staple food crops. Food aid is dropping because the budgets alloted to it are fixed, but the price of the food is going up. At the same time, the biofuel “miracle plant” jatropha is growing on huge plantations. The reason jatropha was supposed to be a good idea is because it is tough enough to grow in arid and marginal lands. Instead, it is being grown instead of food. As the paragraph above points out, poor people will starve, and rich people will drive, fueled by the food taken from poor people’s mouths. The governments of the poor countries will use their armies trained and equipped by the US and other rich countries, to control political dissent. Rich governments will be happy because they don’t have to pass unpopular regulations or raise taxes. The people in the rich countries will tut tut comfortably about how those poor people don’t know how to govern themselves. And even if biofuel contributes more to global warming than does fossil fuel, rich countries will meet their carbon targets, and won’t worry. It is probably a good thing the poor are always with us (Matthew 26:11) that way we can continue to rip them off and avoid any sacrifice or inconvenience to ourselves. Food versus fuel – How high will prices go? How many will go hungry? Investment in fuel ethanol distilleries has soared since the late-2005 oil price hikes, but data collection in this fast-changing sector has fallen behind. Because of inadequate data collection on the number of new plants under construction, the quantity of grain that will be needed for fuel ethanol distilleries has been vastly understated. Farmers, feeders, food processors, ethanol investors, and grain-importing countries are basing decisions on incomplete data. The U.S. Department of Agriculture (USDA) projects that distilleries will require only 60 million tons of corn from the 2008 harvest. But here at the Earth Policy Institute (EPI), we estimate that distilleries will need 139 million tons . . . half the 2008 harvest projected by USDA. This unprecedented diversion of the world’s leading grain crop to the production of fuel will affect food prices everywhere. As the world corn price rises, so too do those of wheat and rice, both because of consumer substitution among grains and because the crops compete for land. Both corn and wheat futures were already trading at 10-year highs in late 2006. The U.S. corn crop, accounting for 40 percent of the global harvest and supplying 70 percent of the world’s corn exports, looms large in the world food economy. Annual U.S. corn exports of some 55 million tons account for nearly one fourth of world grain exports. The corn harvest of Iowa alone, which edges out Illinois as the leading producer, exceeds the entire grain harvest of Canada. Substantially reducing this export flow would send shock waves throughout the world economy. And this soaring demand for corn comes when world grain production has fallen below consumption in six of the last seven years, dropping grain stocks to their lowest level in 34 years. Soaring food prices could lead to urban food riots in scores of lower-income countries that rely on grain imports, such as Indonesia, Egypt, Algeria, Nigeria, and Mexico. Already, the price of Mexico’s staple food, corn tortillas, has increased 400%. I keep reading about various initiatives to grow Jatropha curcas in Ghana to use as bio fuel. I thought I’d find out a bit more. Here is a little bit of what I’ve been finding. Bio fuel might be a very good idea as a short term or transitional power as we move away from fossil fuels. It has downsides as well as advantages. One of the major downsides it that land that is producing crops for bio fuels is not engaged in food production. If land is taken out of food production it means the price of food goes up, and food resources become more scarce. 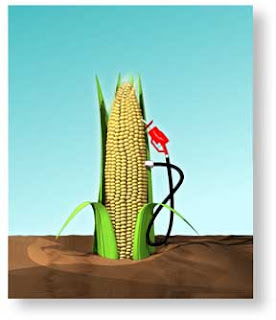 This is currently an issue in the United States with corn grown for bio fuel. Can U.S. farmers keep filling the nation’s bellies as they scramble to fuel its cars? In 1998, about 5 percent of the corn harvest (526 million bushels) went into ethanol production, according to the National Corn Growers Association. This year, the U.S. Department of Agriculture expects ethanol producers to use upward of 2 billion bushels, or nearly 20 percent of the crop. Considering that corn suffuses the U.S. food system — it’s the main feed for beef, poultry, egg, dairy, and hog production, and provides sweetness for candy, cereal, soft drinks, and other supermarket staples — its price can’t suddenly jump without causing repercussions. The Wall Street Journal recently explained succinctly why poultry prices will soon reflect corn’s new popularity as a fuel source. Because of higher corn prices, “It costs nearly a nickel more to produce a pound of chicken today than at the end of 2005, yet the 20-year average industry profit margin per pound of chicken is two cents. . . And adding a nickel a pound for whole chickens at the farm level will ripple up the food system. The issue in Ghana is going to develop differently than in the United States, but it would be helpful to keep our eyes open and try to avoid the mistakes of others. 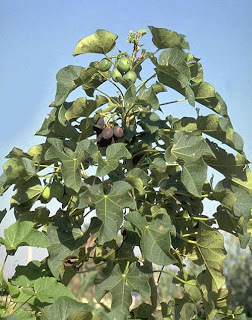 Jatropha curcas is a tough plant that is very drought tolerant, and will grow in marginal land. So it might be a useful plant to grow in some areas. But to put large tracts of land that have been, or could be, used for food production into Jatropha curcas or other bio fuel production, could hurt individuals and the economy, creating more hunger and malnutrition.